Of particular value in the cultural and historical heritage are the works of artists on rare themes and subjects. One of these scenes is the image of the characters from the Bible of Saul and David. The Dutch painter Rembrandt made as many as two canvases with these heroes: the first in 1630, the next in the period from 1655 to 1660. In both paintings the same meaning was laid, but it can be seen from them how the performance skill for almost 30 years has noticeably increased Rembrandt career. For a long time there were disputes about the authorship of the second picture, but the experts, as a result of long investigations, managed to prove the belonging of the canvas. To better understand and feel more clearly the picture, you need to delve into the historical facts. In the book of the Old Testament, Saul is listed as the first king of the kingdom of Israel. David is the second anointed prophet to rule. But before coming to power, David was at the court of Saul a skilled warrior and musician. It is during this period that the painter depicted on the canvas occurs. Saul was not distinguished by humility and God-loving, therefore he was often tormented by gloomy thoughts and bad mood. Only the spiritual playing of a musical instrument was capable of healing the king’s melancholy. Saul was a famous harp master; he eased the weight of the soul of his ruler. In addition to the direct description of the Old Testament plot, the artist pays attention to the issue of social inequality. A man in authority is shown sitting high, large, and the serving musician plays on his knees, his figure is not even completely placed in the composition, it is cut off in a significant part. Saul is holding a spear, thinking again about killing young David. The king anticipates his departure and the triumph of David, unwilling and jealous, he falls into confusion. 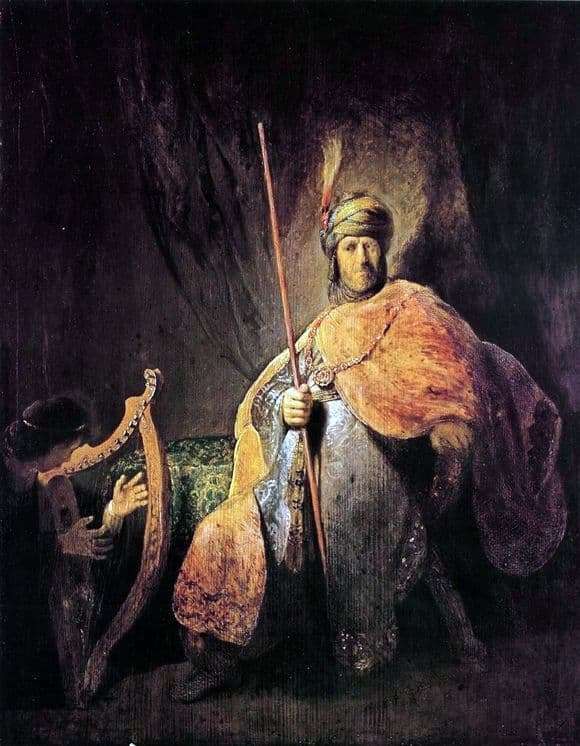 Rembrandt was able to skillfully convey the hidden thoughts and desires that reign in the depths of the characters.